In the first days of Baldwin County, the town of McIntosh Bluff on the Tombigbee River was the county seat. (It is now included in Mobile County, west of Baldwin County.) The county seat was transferred to the town of Blakeley in 1810, and then to the city of Daphne in 1868. In 1900, by an act of the legislature of Alabama, the county seat was authorized for relocation to the city of Bay Minette; however, the city of Daphne resisted this relocation. To achieve the relocation, the men of Bay Minette devised a scheme. They fabricated a murder to lure the Sheriff and his deputy out of the Daphne. While the law was chasing down the fictitious killer during the late hours, the group of Bay Minette men stealthily traveled the seventeen miles (27 km) to Daphne, stole the Baldwin County Courthouse records, and delivered them to the city of Bay Minette, where Baldwin County's county seat remains. A New Deal mural, completed by WPA artists during the Great Depression, depicts these events. It hangs in the Bay Minette United States Post Office. Baldwin County attracted national attention after the 2016 Orlando nightclub shooting as the only county in the United States to refuse to lower its flags to half-staff. Both President Obama and Alabama Governor Robert Bentley had ordered all flags to be lowered immediately following the attack, which was believed to have specifically targeted the LGBTQ community. Citing the U.S. Flag Code, Baldwin County Commissioner Tucker Dorsey stated that while his "heart certainly goes out to the victims and their families," the incident "doesn't meet the test of the reason for the flag to be lowered." In the county, the population was spread out with 23% under the age of 18, 10.6% from 18 to 24, 24.4% from 25 to 44, 28.3% from 45 to 64, and 16.9% who were 65 years of age or older. The median age was 41.1 years. For every 100 females, there were 95.7 males. For every 100 females age 18 and over, there were 95.46 males. The Baldwin County Board of Education / Baldwin County Public Schools oversees most public education in the county. There are Catholic elementary schools in the county, including Christ the King (Daphne), St. Patrick (Robertsdale) and St. Benedict (Elberta). Beginning in 2016 there is also a Catholic high school, St. Michael Catholic High School, located just east of Fairhope. Baldwin County was one of the earliest counties in Alabama where the old-line Southern Democrats began splitting their tickets, and today is one of the most solidly Republican counties in Alabama. No Republican has failed to win a majority in the county since it was easily carried by Democrat George Wallace in 1968. The county is governed by a four-member county commission, elected from single-member districts. A sheriff, coroner, and revenue commissioner are elected in at-large positions countywide. The sheriff of Baldwin County is Hoss Mack (R). Perdido County, Alabama would contain northern Baldwin County, divided by a straight line extending westward from the northwestern tip of Florida, and western Escambia County, west of Big Escambia Creek. (The Flomaton area is excluded via a prominent power line easement, from Big Escambia Creek to the Florida state line.) The southwestern tip of Conecuh County, also west of Big Escambia Creek, may be included as well. The headwaters of the Perdido River rise near the center of this proposed county. The Perdido County seat would be Atmore. The county has been proposed by city of Atmore backers, who believe that their growing city of over 10,000 residents should be a county seat. Furthermore, county backers believe that Atmore belongs in the Mobile-Daphne-Fairhope metropolitan combined statistical area, which would become much more likely within its own exurban-leaning county. Brewton would remain the county seat of rural-leaning Escambia County. 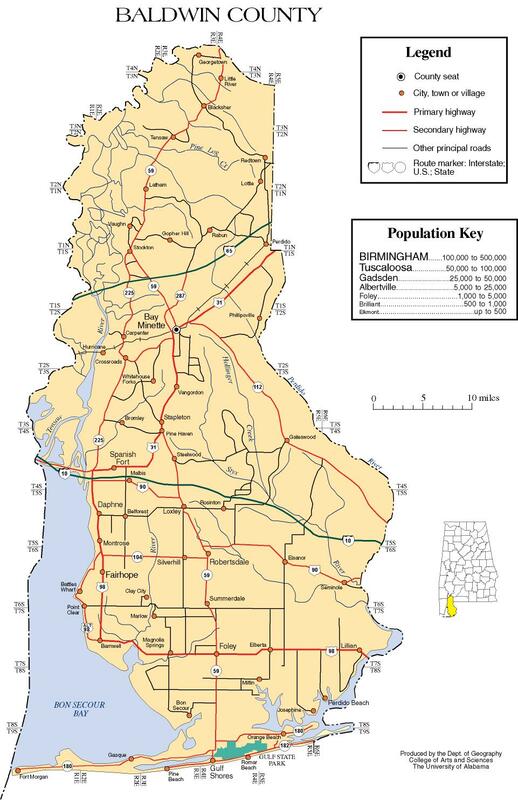 In addition to the incorporated city of Atmore, Perdido County would include the unincorporated communities of Blacksher, Canoe, Freemanville, Huxford, Nokomis, Perdido and Tensaw. ^ a b c A Digest of the Laws of the State of Alabama: Containing the Statutes and Resolutions in Force at the end of the General Assembly in January, 1823. Published by Ginn & Curtis, J. & J. Harper, Printers, New-York, 1828. Title 10. Chapter III. Pages 81-82. An Act to divide Washington County, and for other purposes therein mentioned.--Passed December 21, 1809. ^ "Various Historical Compilations about Baldwin County, Alabama". Baldwin County, Alabama. Archived from the original on 2007-08-28. Retrieved 2007-05-25. ^ "ADAH Historical Markers—Baldwin County: A County Older than the State". Texts of historical markers placed by Alabama Historical Society. Alabama Department of Archives & History. Archived from the original on January 7, 2008. Retrieved 2007-10-29. ^ "History-Compilations". Co.baldwin.al.us. Archived from the original on 2011-07-16. Retrieved 2010-07-22. ^ "Alabama Disaster History". FEMA website. Archived from the original on 2 July 2007. Retrieved 2007-06-22. ^ "Special Title I Assistance to Victims in Presidentially Declared Major Disaster Areas - Alabama, Vermont, Washington State and Michigan". hudclips.org. Archived from the original on 2007-09-26. Retrieved 2007-06-22. ^ "Designated Counties for Alabama Hurricane Georges". FEMA website. Retrieved 2007-06-22. ^ "Designated Counties for Hurricane Ivan". FEMA website. Retrieved 2007-06-22. ^ "Alabama Hurricane Katrina". FEMA website. Archived from the original on 2007-07-01. Retrieved 2007-06-22. ^ CNN, Deena Zaru. "Alabama county refuses to lower flag to honor Orlando victims". CNN. Retrieved 2016-06-17. ^ "U.S. Decennial Census". United States Census Bureau. Archived from the original on May 12, 2015. Retrieved May 15, 2014. ^ "Historical Census Browser". University of Virginia Library. Retrieved May 15, 2014. ^ "Population of Counties by Decennial Census: 1900 to 1990". United States Census Bureau. Retrieved May 15, 2014. ^ "Census 2000 PHC-T-4. Ranking Tables for Counties: 1990 and 2000" (PDF). United States Census Bureau. Retrieved May 15, 2014. ^ "Association". Alabama Sheriffs. Retrieved 2010-07-22. Wikimedia Commons has media related to Baldwin County, Alabama. Wikivoyage has a travel guide for Baldwin County (Alabama). Baldwin County map of roads/towns (map © 2007 Univ. of Alabama).